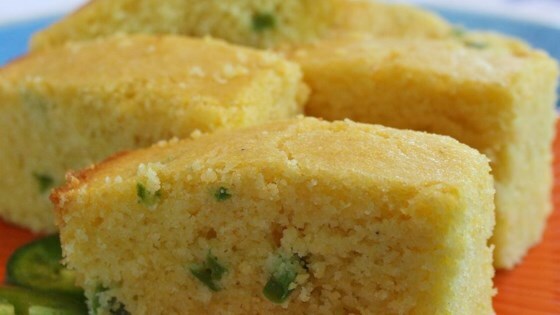 "A surprisingly tasty blend of sweet cornbread and jalapeno peppers. If you love hot peppers and cornbread, then you must try this recipe." Beat margarine and sugar together in a large bowl until smooth. Combine cornmeal, flour, baking powder, and salt in another bowl. Stir eggs and milk in a third bowl. Pour 1/3 milk mixture and 1/3 flour mixture alternately into margarine mixture; whisk until just mixed. Repeat with remaining ingredients and stir in jalapeno peppers. Spread mixture evenly into prepared baking pan. Bake in preheated oven until a toothpick inserted into the center comes out clean, 22 to 26 minutes. Cool in the pan for 10 minutes before slicing. Recipe works well with 1/2 to 1 cup sugar; adjust to suit your taste. The batter should be thick enough to not pour easily. It is important to grease pan and chop peppers before starting. Allowing mixture to stand, then disturbing will reduce the effectiveness of the baking soda. Added kernel corn and cheddar cheese to it. Great cornbread recipe! I used 3 jalapenos, added a handful of cheddar cheese to it and when it was finished drizzled some honey over it. It was delish!